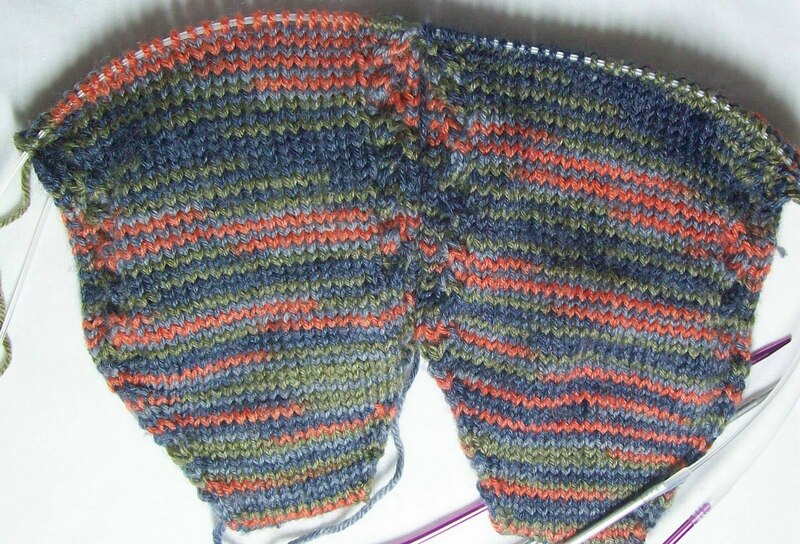 Ok, so I am still knitting the socks.. Look see how much I've done—about 4. 5 inches (a bit over 10cm) It hard to see--(and it changes depending on the light) but the dark grey is a lovely gun metal grey—that looks almost blue. They're looking good, the colors pool nicely into sort of spiral stripes. 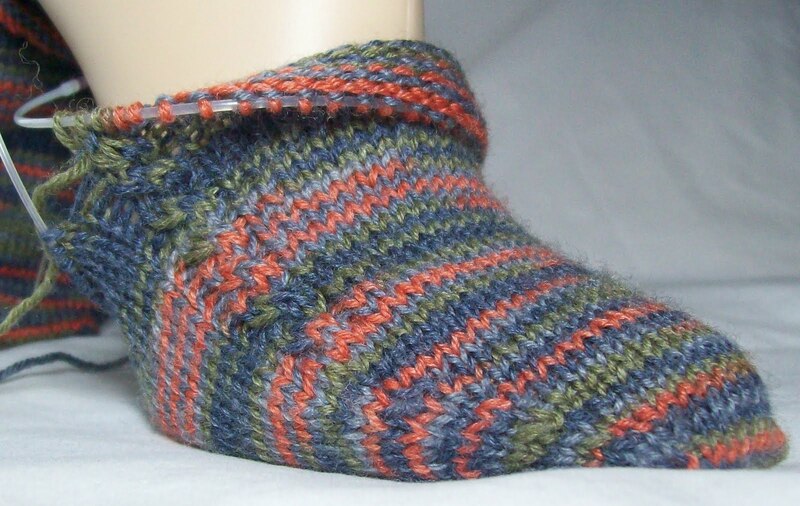 I am happy with the yarn, happy with the socks. BUT—I am still knittng (on one sock) the yarn barf that exploded out of the center of the ball when I started. 4.5 inches of knitting--and its still not all knit up! Why? Why can I buy Red Heart Super Saver, and find on the ball band an arrow—one that says; pull this end--> and you do, and you find the center of the skein, and pull it out, and start knitting. Why does no other yarn company do this? Why doesn't Red Heart do it for Heart and Sole, or other lines of their yarn? Why only on the cheapest line they offer, to they have the most convenience? Why doesn't every Coats & Clarks (world wide) skein do this? Look at some some of those beautiful colors, the beautiful self patterning, the wear like iron German sock yarns—the ones we all love--They too are Coats & Clarks. Why don't they have the same easy to find the center of a center pull skein? Why is it that the lowest of the low, the yarn every one claims to hate (and yet—I can't believe the big box craft stored give it so much shelf space it every one truly hated it) why is it this yarn has easy to use center pull skeins? I, of course, know this (and a percentage of you do too,) because I (and you) have knit with said yarn. I haven't bought any in years.. but stash—good stash (oh, the silk, oh the angora) and bad stash has a way of multiplying (I swear, some yarn is alive and breeds like rabbits!) and my stash of Red Heart seems undimimished—no matter how much I knit with it—and how little I buy! Usually—on most skeins—that is non-Red Heart Super Saver skeins-- I am able to pull out a small 'hair ball' of yarn and find the center with out having 20 or 30% ball come out in a big yarn barf. But not always—except when I go to my jumbo skeins of Red Heart. Then, I follow the directons, and start neatly. So—Let us praise this yarn, and pray the simple convenience it offers becomes universal. hair ball of yarn--that cracked me up!